Begonia Non Stop lives up to its name providing a non-stop parade of colour all summer long. Bred to produce large upright flowers with strong stems in beautiful bold colours. Ideal for filling up beds and borders, or for creating stunning displays in patio pots & containers. Tolerant of all summer weather and flowering right until the first frosts of Autumn. Supplied as 18 jumbo plug plants in a mix of reds, yellows, pinks, oranges and white. 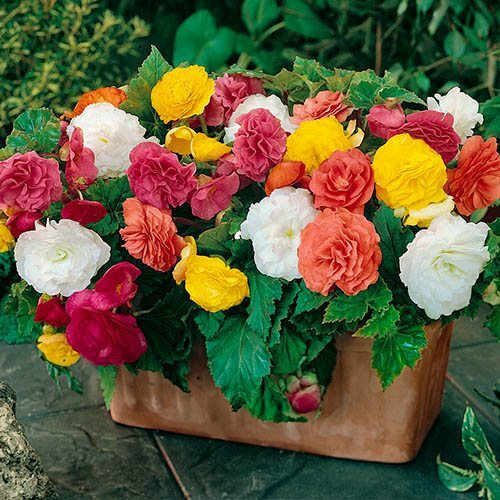 The perfect partner for Begonia Illumination, Begonia Non-Stop is so named because of its prolific flowering characteristics it literally smothers itself in vibrant, brightly coloured double flowers permanently from late April until the first frosts in the autumn. It is really easy to grow in beds and borders as well as patio containers and has such a good reputation with professional growers it is an almost permanent feature in park displays. This is especially so because the faded flowers drop off without the need for dead-heading making way for fresh flowers without any work required! In your garden the large, slightly upward facing flowers which reach 10-15cm across, will be held on strong stems. They are really weather resistant and will thrive in any conditions from the hottest summer days to typically showery summer weather. The colour range is stunning with all shades of red, orange, pink, yellow and white included.Perfect for hanging baskets and tubs where the plants can trail. Supplied as 18 Jumbo Plug Plants (2.5 - 3.5cm diameter) in mixed colours. Flowers from late May until first frosts in the autumn. Upright growing to 25-30cm tall. Not frost hardy so keep protected until the last frost. Grow on in full sun or partial shaded areas. The sunnier the site, the more vibrant the colours will be. Water regularly during the summer - begonias thrive in moist soil.